It seems like lately, the market for at-home hair removal systems with light, laser, pulsed thermicon or IPL technology have increased dramatically. A few years ago you could only have this type of hair removal done in a clinic or doctor’s office. Technology has really changed, and if you are looking for a way to ditch razors, wax, salons, clinics, and epilators, these at home ways might be worth looking into. Now that you have the option of using these technologies at home, all you have to do is decide which technology makes the best hair removal products, right? To help you we have sorted the products based on the TECHNOLOGY they use, so you can compare apples to apples. Well, sort of. Read on and you can decide for yourself. Intense Pulsed Light or IPL works by sending out a pulse of intense light in the range of 400 to 1200 nm. Filters can be applied to the light, depending on the treatment. The UV light is usually filtered out. The light left after filtering targets melanin in hair, heating and destroying it. It works similar to the diode laser, except the light is broad spectrum, not targeted to one wavelength like the diode. IPL, like the diode laser, targets the melanin-rich root of the hair. This means it can only be used with darker hair. Since it targets melanin, it can not be used on darker skin, which is melanin-rich. 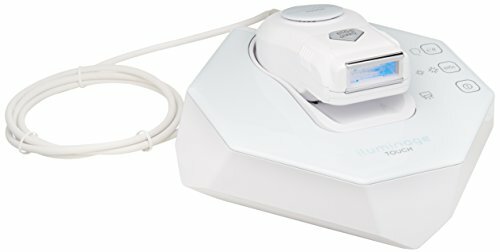 This Braun IPL hair remover has a tone indicator, the ‘Sensodapt’, that lets the user know if their skin tone is appropriate for treatment. The Sensodapt scans the skin 80 times per second and then adapts the level of intensity of the light based on how light or dark the skin in a particular area is. The unit is built to last between 6 and 14 years, depending on the frequency of use and area covered. There are no replaceable parts and this is a corded unit, making it simple to use. This unit stings a bit to use but is tolerable for most people, however some experience more pain, redness, and swelling of treated areas. ‘Sensodapt’ sensors adjust light for you. Can’t manually adjust the level of light intensity. This is a good choice if you are willing to put in the time and Consistency in using it, have lighter skin tones and darker hair, you will see results. 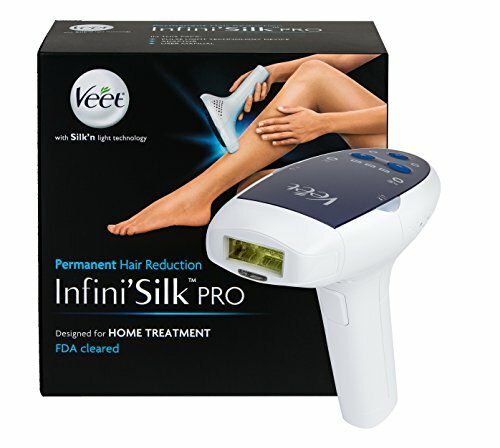 The Veet IPL device features 5 adjustable intensity levels. This is a corded unit. The light cartridges are replaceable, lasting 5000 pulses each. The laser window is relatively large, especially compared to the Tria Diode laser. The shape of the Veet IPL hair remover is like a barcode scanner the cashier at the store uses and fits ergonomically in the hand without tiring it out. This unit, like all IPL units, is only for brown or black hair and light to olive skin tones. A corded unit that always has enough power. Ergonomic handle for comfort during extended laser sessions. Replacement heads may be challenging to find. If you are looking to try IPL this entry-level model will get you started so you can see if IPL works with your lifestyle and skin tone/hair color. The Iluminage says it works on all skin tones and hair colors, and most hair colors. The system uses IPL combined with Radio Frequency technology to remove hair. This is a corded unit and the IPL head is rated for 120000 flashes. Can be used on face and body. While doing some research on this Iluminage hair removal review, I learned that darker skin tones have longer treatment times. The company recommends shaving before treatment. The energy level is adjustable, the cord is a comfortable length and the unit is durable as well as effective at reducing hair. If you have a darker skin tone, this IPL hair removal, and reduction device may be the one to try. Overall, this is one of the best hair removal products I reviewed because it is effective and works with many skin tones. Diode lasers act by way of “selective photothermolysis” which targets melanin, damaging the area around the melanin, including the root and hair shaft. The laser disrupts the growing process of the hair and slows it down, reducing the amount of hair that grows back. Because it targets melanin, diode lasers cannot be used on people who have dark skin. Technically speaking, there are 6 skin pigmentation levels. 1 being the lightest or having the least melanin. 6 is the darkest or has the most melanin. Diode lasers are only appropriate for levels 1,2, 3 and 4. As for the hair color, since diode lasers target melanin, the pigment that colors hair, these lasers only work on hair that has color, or significant color, meaning only brown or black hair. The diode laser is not effective on blonde, gray, or red hair. The Tria is effective at slowing hair growth on people with pale to light brown skin tone and light brown to black hair color. The Tria has 5 levels of treatment. It can be painful and many say levels 4 and 5 hurt quite a lot. The Tria has a tone indicator to say if it is safe to use on your skin tone. Also, the fan on the laser unit can be loud. Tria is designed to be used once every two weeks. It slows hair growth and with Consistent use stops hair from growing. Underarms and bikini line take quite a while longer to remove hair vs. legs where hair disappears from faster. 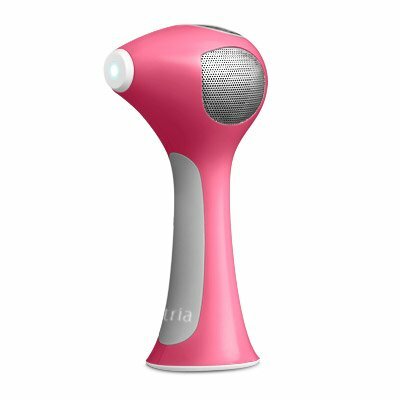 During my research for this Tria hair removal review, I learned that you should never use the Tria in an area with tattoos. The laser will direct the beam on the tattoo pigment and cause blisters or burns in the skin. For lighter skin/ darker hair only. It may be more painful for others. If you have a lot of patience, tolerance to pain, and the correct skin tone and color, this may be the best at home laser hair removal device for at home use you will find. Read more about good laser hair removal devices here. But more importantly, I advise you to read my article on the different types of lasers used in laser hair removal, so you know what you’re paying for and if it’ll work for your skin and hair type. Thermicon technology is a patented technology used by Radiancy, the makers of the no! no! hair removal system. Pulsed Thermicon technology works by sending a gentle pulse of heat down the hair shaft, to the follicle or root of the hair. When the blade touches the hair it singes or burns it, basically. The heat that was sent down to the root crystallizes the hair near the skin’s surface, turning the hair to ash. The hair is not burnt all the way down to the root, only the upper part, just beneath the skin’s surface is crystallized. You may notice stubble from this crystallized hair. The heat signal travels all the way to the root and interrupts communication in the hair follicle that leads to hair growth and the result is that the hair is slow to grow back. This disruption, if practiced often enough, lengthens the time it takes the hair to re-grow. Pulsed Thermicon takes patience and Consistent use to work. But Why? The first reason you need to use the system for a long time to see results is that disrupting the signal once will not always significantly reduce the time it takes to re-grow. Repeated disruption is needed to see long-term results and some hair follicles are more persistent and faster at generating re-growth than others. The second reason the process takes time is due to the nature of the hair life cycle. Did you know there is a time in the life of a hair that it just hangs out in the follicle, not connected to the root? In the phases of Catagen and Telogen, the hair is not actively growing and is not connected to the root. If the hair is not connected to the root, pulsed Thermicon can only burn and crystallize the hair, but the disruption signal has nothing to disrupt since the hair is not connected to the root. Pulsed Thermicon can only disrupt the signal for hair growth during the active growing stage of the hair, called Anagen. Each individual hair you have has its own cycle. They do not cycle at the same time. So the pulsed Thermicon ‘works’ on all hair, but only disrupts the signal on hairs in the Anagen phase. Pulsed Thermicon technology is safe for all skin colors and pigmentation levels. Thermicon technology also works with blonde and grey hair, which is in contrast to light or laser systems that work better with dark hair and can’t be used on darker skin. This No No hair removal review showed the system is an effective hair removal system if used Consistently over a long time period. It has been studied and shown to be effective and is comparable in results to other light and laser technologies. It does take time to see long-lasting results, but the hair that is crystallized can be buffed off right away. With time, the hair stays away for longer and longer. Can be used on dark skin or light skin. Can be used on gray, blonde, brown, red or any color hair. The unit has three treatment levels. Rechargeable battery and charging cable. One of the best long-term hair removal systems for people of all skin tones and hair colors. If you have been looking for a long-term solution you can use from home, this might be for you. Maybe you have never heard of ‘micro-oscillation”- I hadn’t. It was hard to dig up information on this so-called Micro-oscillation technology. There are only a few hair removal devices I found that use this technology, and the Yes! Hair remover by Finishing touch seems to be the most prominent manufacturer. I investigated the Yes! by finishing Touch website to see if I could find more information on how micro-oscillation works. The website is not specific on how it works, but it does say “a finely engineered oscillating blade moves against a second stationary blade to trim hair.” Which leads me to believe it acts as an electric razor. Micro = Small. Oscillation = turning or spinning. The company says when the oscillating blade spins and meets the stationary blade, the hair is trimmed. That is how an electric razor works, so it seems this micro-oscillation is a style of electric razor. This hair remover boasts micro-oscillation and patented Sensa light technology. The device creator is Andy Khubani according to an as Seen on TV News release. The Sensa-light technology is part of the system that activates the oscillation blades. 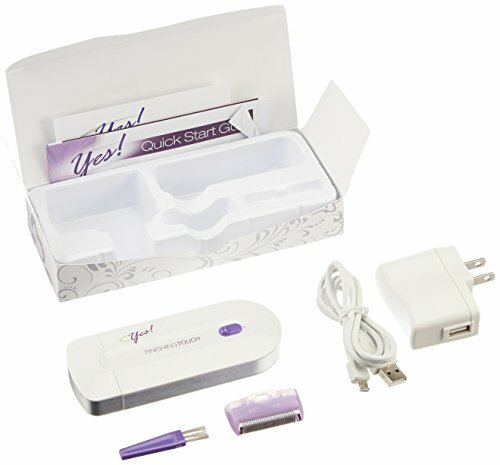 The Yes hair removal review revealed the light itself does not remove hair or prevent hair growth. 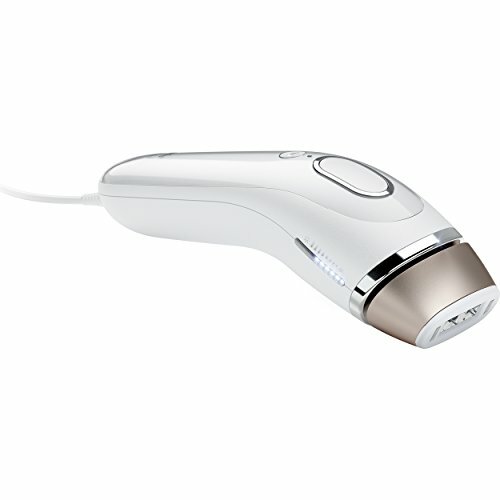 The light is involved in communicating to the hair remover unit that the head on the unit is near the skin, at which point the unit turns on and stays on as long as the head of the unit is in contact with your skin. So, basically, the Sensa-light technology turns the unit on and off. The micro-oscillation describes the movement of the blades that cut the hair. That is how this Yes! By Finishing Touch hair remover works. Removes hair, similar to an electric razor. Has a rechargeable lithium-ion battery. Includes one micro foil head and one trimmer head. Must replace heads when the light stops working. 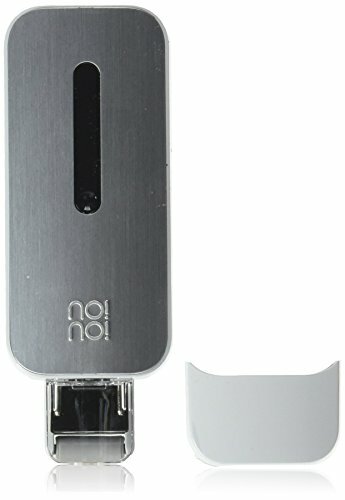 If you need a travel hair remover this is a portable option that you do not need to buy batteries for. It also includes a handy trimmer to clean up and touch up any area you need. It’s also good for young folks just learning the ins and outs of hair removal as it is very safe to use. Chemical hair removers, commonly known as depilatory creams, use calcium thioglycolate and potassium thioglycolate. These chemicals break down the bonds in the keratin structure of the hair turning the hairs to soft gelatin-like strings. Once the hair is soft, you wipe the cream and the hair with it off with a wet washcloth. Then you wash and rinse the area treated. It is a basic, but proven technology that effectively removes hair right below the skin surface. The hair will grow back in 2 to 4 days. Chemical removal usually lasts longer than shaving, but not as long as removing hair from the root. It is painless and easy and makes skin so smooth many women believe it is the best at home hair removal product. This kit comes with a pre-treatment balm that you rub into the area of the face you are removing hair from. Then you apply the hair remover, being careful NOT to rub it in. Let the remover sit for 3 to 10 minutes and remove with a soft damp washcloth. This cream hair remover is very effective removing facial hair and is among the best facial hair removers. Hair remover is only a small quantity, 0.6 oz. Is this the best facial hair remover? 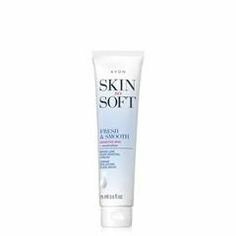 Definitely, if you have sensitive skin. I love it, so this deserved a spot here as one of the best facial hair removal creams. This is one of the most effective bikini hair removal creams on the market. 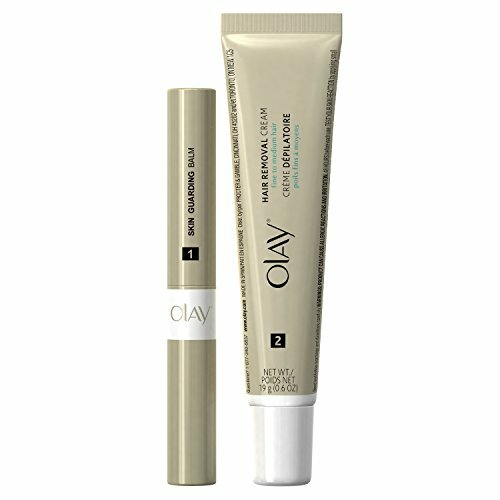 It leaves the area soft, is fragrance-free, and formulated especially for sensitive skin. If you want to remove hair from the bikini line and you have sensitive skin, this is the cream hair remover for you. Among the best bikini hair removal creams, I found. This hair removal is designed especially for the face. It comes in a small 1.7 oz container. Aloe Vera is included in the formulation to soothe skin. The applicator is a small brush, so you don’t have to get it on your hands. The applicator is narrow and makes application easy. I was delighted to find out that this formulation of Sally Hansen brush on hair remover for the face is pretty thick and does not drip. Large bottle for face formulation. 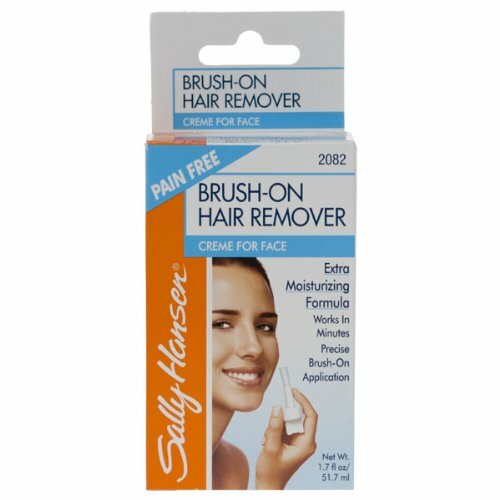 If you want to remove facial hair quickly without hassle or added steps, this paint on hair remover is a must try. Well, for the simple reason of – it is so easy to use. You may know that there are 2 brands that stand among depilatory creams. So, why not look at them? Take a look at what Veet and Nair have to offer. Turmeric powder, known as ‘Manjal Thool’ in the Tamil language, is used in India and ancient Ayurvedic medicine to slow and prevent hair growth. You use turmeric as a paste, applied to areas you want to slow growth and over time the hair growth slows down and less hair can be seen. 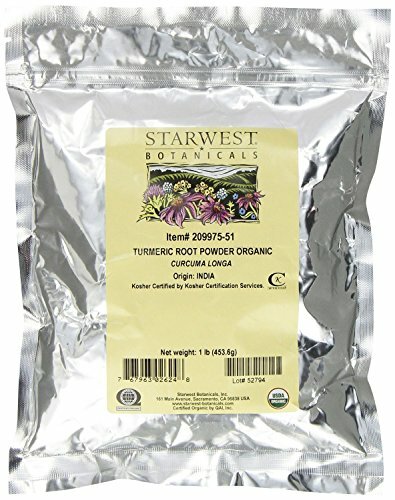 This turmeric hair removal review revealed that turmeric has a ton of other health benefits and it is quite inexpensive, so it’s worth a try. To make the paste you just need 1 teaspoon of turmeric and a few drops of coconut oil/fat-free yogurt/or even milk. Mix the liquid a drop at a time into the powder until paste-like consistency forms you can make the paste as thick or thin as you like. If using on small areas, like between eyebrows, or on the upper lip, make a stiffer paste that won’t drip. If using on larger areas, make a thinner paste so it spreads easier. Apply to the area you want to stop growth. Leave on for 5 to 15 minutes and wipe off with an old washcloth. Turmeric stains everything, including your clothes, the washcloth, the counters, and even your skin if you leave it long enough. You can use this once a day and should start seeing finer hair and stunted growth in a month. One bag will last a very long time unless you make curry a lot. Stains, not immediate removal of hair. If you want a natural solution use the good things the earth has provided and try powdered turmeric on unwanted hair. Since women have this awesome feature called “intuition” you should just pick the one that spoke to you the most as the best hair removal product and you’ll be good to go. LumaRx IPL Hair Removal Review (2019) – How Good Is It Really? Silk n’ Flash Go Review 2019 – Is it Worth Your Money and Time? Best Laser Hair Removal Machines at Home (2019) – Hairs Be Gone!